If Oscar De La Hoya gets his way, boxing fans may soon be seeing a fight between Lucas Matthysse and Ruslan Provodnikov taking place this year. De La Hoya is reportedly working hard to try and put the fight together. It’s a doable fight due to Provodnikov not being promoted by Golden Boy rival Top Rank, and a situation where the Russian fighter needing a win badly after his loss to Chris Algieri last year. Provodnikov lost his WBO light welterweight title in that fight to Algieri, and he’s done much since then other than beat a 40-year-old Jose Luis Castillo recently. 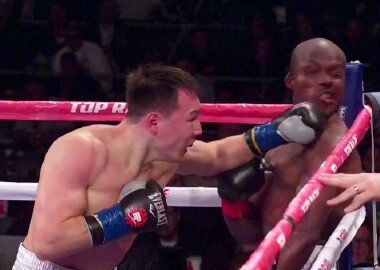 Provodnikov took major criticism for fighting a guy as old as well past it as Castillo, because boxing fans expected much more from him than dipping that far down the food chain. But the Russian fans are familiar with Castillo, and it was a viable fight to make for him due to him having been passed over by Manny Pacquiao. De La Hoya is also trying to put a fight together between Saul “Canelo” Alvarez and Miguel Cotto, but the negotiations for that bout have reached a stalemate after some early progress. It’s now looking like the fight might not get made. That’s why the Matthysse vs. Provodnikov fight is so important, because it might be the only important fight that De La Hoya can make all year. Matthysse is still trying to put his career back together after a loss to Danny Garcia over a year ago. Matthysse came back to defeat John Molina Jr by a stoppage win in 2014, but the fight was harder than expected with Matthysse getting dropped twice. He hasn’t done much since that fight. That would be a great fight if he can put together the Matthysse-Provodnikov match. However, there’s still a chance that it doesn’t take place because Provodnikov’s management are still talking about other fights besides the Matthysse match-up, and it’s quite possible Provodnikov could go in another direction. Matthysse needs to make a move on one of the world titles because he’s getting up there in age at 32 and he doesn’t have forever to try and make a mark. He wants to move up to welterweight next year, but there’s really no point in him doing that if he can’t beat the best light welterweights.